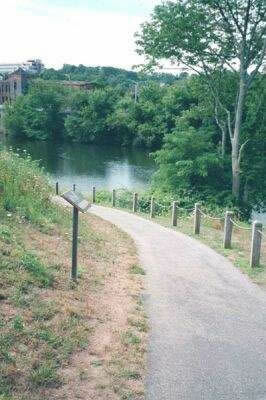 This Riverfront trail along the Yantic River and Norwich Harbor includes historic and interpretive signs describing Chelsea Landing. The trail follows City streets for short segments. Walk upstream starting from Howard T. Brown Park on Norwich Harbor at Chelsea Harbor Drive to Yantic Falls. To help you reach Heritage Riverfront Park Walkway entrance at Howard T. Brown Park, some routes leading to this site are posted with the brown and white Long Island Sound Access sign. From the East: Take I-95 South to I-395 North. Take exit 80 (Route 82/Downtown Norwich) turn right off ramp onto Salem Tpke./Route 82 toward downtown Norwich. Proceed 2.1 miles then turn right onto Washington Street/Route 2 East after passing over Yantic River. Proceed .25 miles and after passing the Marina at American Wharf turn right into Howard T. Brown Park and entrance to Heritage River Trail. From the West: Take I-95 North to I-395 North. Take exit 80 (Route 82/Downtown Norwich) turn right off ramp onto Salem Tpke./Route 82 toward downtown Norwich. Proceed 2.1 miles then turn right onto Washington Street/Route 2 East after passing over Yantic River. Proceed .25 miles and after passing the Marina at American Wharf turn right into Howard T. Brown Park and entrance to Heritage River Trail. Parts of the site offering views of the water are wheelchair accessible. Some facilities/uses listed may not be fully accessible to the mobility-impaired.